Although it officially opened its doors on August 28th, the AC Hotel Cleveland Beachwood held it's coming out party last week with drinks, food, charcuterie, music and fun. 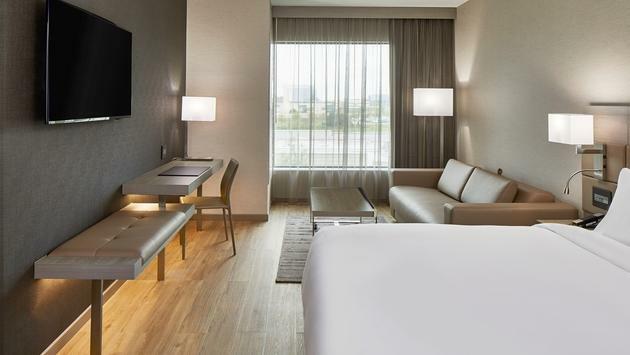 The hotel, the Cleveland area's first foray into the AC brand, is set amidst the city's newest high-end so-called lifestyle center, the highly anticipated Pinecrest Development. 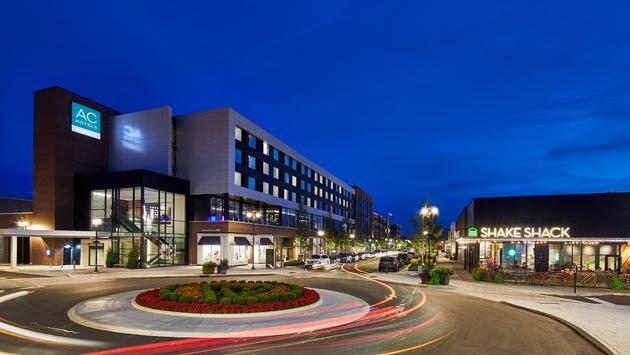 Pinecrest, with a bevy of shops, boutiques, restaurants, and more, is a $230 million development that opened to the public in late June—businesses continue to open in the development, many of which are completely new to this region. One thing AC focuses on is local flavor, and this property delivers. Guests at the grand opening party were treated to local Ohio cheeses and sausages, drink mixers made in nearby Cleveland and also some local samples—folks from the nearby Candle Studio worked with guests to create room diffusers, candles, and room sprays. I spoke with Kim Soria, General Manager of the hotel, and she talked about the local flavor. "With the AC brand, we like to bring in local people. You'll see this evening, we have Ohio Provisions here and our local floral elixirs; we have a local musician downstairs at the entrance. We like to bring in locals once a week and entertain or talk about their product. They may do a little demonstration to get our guests involved," she said. "Our AC Store is also very local. We have Malley's Chocolates, which is local to Cleveland, we have OH! Chips, we have Fear's Confections, a Cleveland bar, buckeyes candies, Mitchell's Homemade Ice Cream in our freezers." AC Hotel Cleveland Beachwood is owned and operated by Rochester, N.Y.-based DelMonte Hotel Group. Billed as a European-inspired property, it was designed by Meyers + Associates Architecture and features 145 guest rooms. Designers used layers of deep gray and charcoal tones, capturing the brand’s sophisticated and modern feel. Guest rooms have hardwood floors and monochromatic color schemes. The expansive AC Lobby, located on the second floor, features open-concept spaces, ambient lighting and cozy seating in the AC Library and Lounge areas. 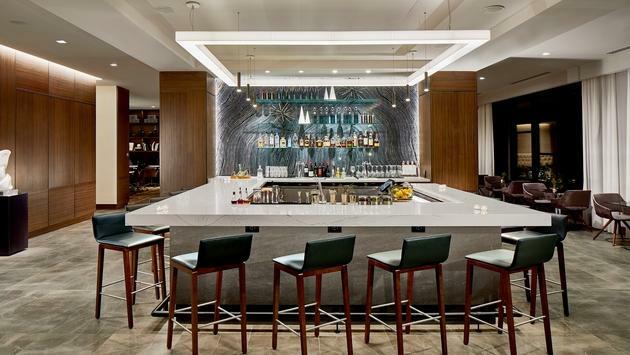 Particularly impressive is the dramatic hotel bar, which includes offerings of local craft beers, specialty wines, expertly-made signature cocktails, including the AC brand’s Gintonic, and a selection of tapas-style small bites. AC Hotel Cleveland Beachwood also has a 24-hour fitness center and event spaces including a 1,075-square-foot ballroom and a 288-square-foot boardroom, both equipped with state-of-the-art audio and visual technology. Soria noted that so far, the hotel's weekdays are mostly business traveler—primarily on Tuesdays and Wednesdays they are getting a lot of volume coming through. "On weekends, this market is very heavy with the social business—quite a bit of weddings, and bar and bat mitzvahs, and other celebrations," she said. "We do a lot of group rooms. 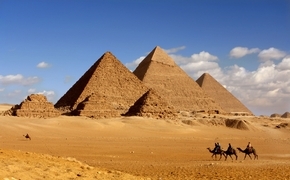 The weekends are more the leisure traveler, as you'd expect."